The EFF and other activists are promoting NetNeutrality in response the to FCC's request for comment. What they tell you is a lie. I thought I’d write up the major problems with their arguments. Proponents claim they are trying to “save” NetNeutrality and preserve the status quo. This is a bald-faced lie. The truth is that NetNeutrality is not now, nor has it ever been, the law. Fast-lanes have always been the norm. Most of your network traffic goes through fast-lanes (“CDNs”), for example. The NPRM (the FCC request for comments we are all talking about here) quite clearly says: "Today, there are no legally enforceable rules by which the Commission can stop broadband providers from limiting Internet openness". NetNeutrality means a radical change, from the free-market Internet we’ve had for decades to a government regulated utility like electricity, water, and sewer. If you like how the Internet has been running so far, then you should oppose the radical change to NetNeutrality. Proponents claim there is something “technical” about NetNeutrality, that the more of a geek/nerd you are, the more likely you are to support it. They claim NetNeutrality supporters have some sort of technical authority on the issue. This is a lie. The truth is that NetNeutrality is pure left-wing dogma. That’s why the organizations supporting it are all well-known left-wing organizations, like Greenpeace, Daily Kos, and the EFF. You don’t see right-wing or libertarian organizations on the list supporting today’s protest. In contrast, other issues like the "SOPA blackout" and protests against the NSA enjoy wide bi-partisan support among right-wing, libertarian, and left-wing groups. Your support of NetNeutrality correlates with your general political beliefs, not with your technical skill. One of the inventors of TCP/IP is Vint Cerf who supports NetNeutrality – and a lot of other left-wing causes. Another inventor is Bob Kahn, who opposes NetNeutrality and supports libertarian causes. NetNeutrality is a political slogan only. It has as much technical meaning has "Hope and Change". Ask 10 people what the phrase technically means and you'll get 13 answers. The only case where NetNeutrality correlates with technical knowledge is among those geeks who manage networks – and it’s an inverse correlation (they oppose it). That’s because they want technologists and not politicians deciding how to route packets. Proponents claim that fast-lanes for some will mean slow-lanes for everyone else. The opposite is true – the Internet wouldn’t work without fast lanes, because they shunt high-volume traffic off expensive long-distance links. The fundamental problem with the Internet is the “tragedy of the commons” where a lot of people freeload off the system. This discourages investment needed to speed things up. Charging people for fast-lanes fixes this problem – it charges those willing to pay for faster speeds in order to invest in making the Internet faster. Everyone benefits – those in the new fast-lane, and those whose slow-lanes become less congested. This is proven by “content delivery networks” or “CDNs”, which are the most common form of fast lanes. (Proponents claim that CDNs aren’t the fast lanes they are talking about, but that too is a lie). Most of your network traffic doesn’t go across long-distance links to place like Silicon Valley. Instead, most of it goes to data centers in your local city to these CDNs. Companies like Apple and Facebook maintain their own CDNs, others like Akamai and Lightspeed charge customers the privilege to be hosted on their CDNs. CDNs are the very essence of fast lanes, and the Internet as we know it wouldn’t happen without them. 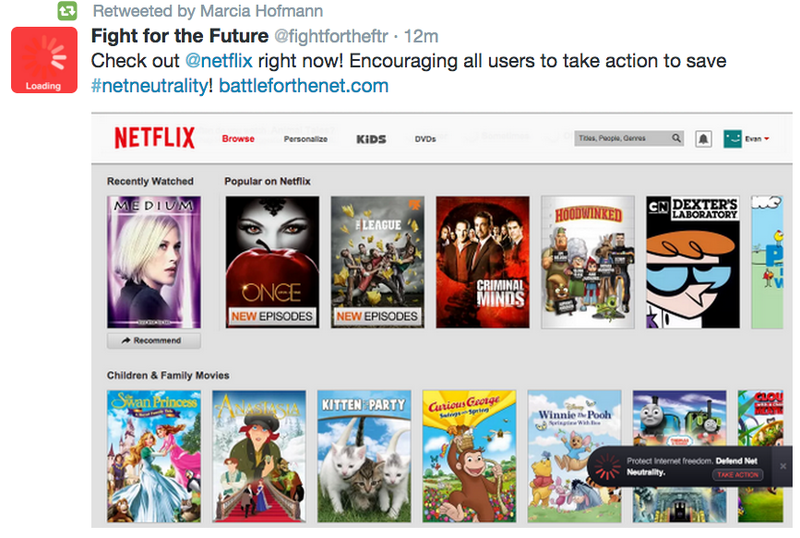 NetNeutrality proponents claim bad things will happen in the future. These are lies, made-up stories designed to frighten you. You know they are made-up stories because NetNeutrality has never been the law, and the scary scenarios haven’t come to pass. The left-wingers may be right, and maybe the government does indeed need to step in and regulate the Internet like a utility. But, we should wait for problems that arise and fix them – not start regulating to prevent bad things that would never actually occur. It’s the regulation of unlikely scenarios that is most likely to kill innovation on the future Internet. Today, corporations innovate first and ask forgiveness later, which is a far better model than having to ask a government bureaucrat whether they are allowed to proceed – then proceeding anyway by bribing or lobbying the bureaucrats. Proponents claim that a few bad things have already happened. This is a lie, because they are creating a one-sided description of events. For example, a few years ago, Comcast filtered BitTorrent traffic in a clear violation of NetNeutrality ideals. This was simply because the network gets overloaded during peak hours (5pm to 9pm) and BitTorrent users don’t particularly care about peak hours. Thus, by slowing down BitTorrent during peak hours, Comcast improved the network for everyone without inconveniencing BitTorrent users. It was a win-win solution to the congestion problem. NetNeutrality activists hated the solution. Their furor caused Comcast to change their policy, no longer filtering BitTorrent, but imposing a 250gig bandwidth cap on all their users instead. This was a lose-lose solution, both BitTorrent users and Comcasts normal customers hated the solution – but NetNeutrality activists accepted it. NetNeutrality activists describe the problem as whether or not Comcast should filter BitTorrent, as if filtering/not-filtering where the only two choices. That's a one-sided description of the problem. Comcast has a peak-hour congestion problem. The choices are to filter BitTorrent, impose bandwidth caps, bill by amount downloaded, bill low-bandwidth customers in order subsidize high-bandwidth customers, cause all customers to suffer congestion, and so on. By giving a one-sided description of the problem, NetNeutrality activists make it look like Comcast was evil for choosing a bad solution to the problem, but in truth, all alternatives are bad. A similar situation is the dispute between NetFlix and Comcast. NetFlix has been freeloading off the system, making the 90% of low-bandwidth customers subsidize the 10% who do streaming video. Comcast is trying to make those who do streaming to pay for the costs involved. They are doing so by making NetFlix use CDNs like all other heavy users of the network. Activists take a very narrow view of this, casting Comcast as the bad guy, but any technical analysis of the situation shows that NetFlix is the bad guy freeloading on the system, and Comcast is the good guy putting a stop to it. Companies like Comcast must solve technical problems. NetNeutrality deliberately distorts the description of the problems in order to make corporations look evil. Comcast certainly has monopolies in big cities on broadband (above 10mbps) Internet and we should distrust them, but the above examples were decided on technical grounds, not on rent-seeking monopolist grounds. I’m not trying to sway your opinion on NetNeutrality, though of course it’s quite clear I oppose it. Instead, I’m trying to prove that the activists protesting today are liars. NetNeutrality isn’t the status quo or the current law, it’s not being “saved”. NetNeutrality is pure left-wing politics, not technical, and activists have no special technical authority on the issue. Fast-lanes are how the Internet works, they don’t cause slow-lanes for everyone else. The activists stories of future doom are designed to scare you and aren’t realistic, and their stories of past problems are completely distorted. Frankly, activists are dishonest with themselves, as shown in the following tweet. In their eyes, Comcast is evil and "all about profits" because they lobby against NetNeutrality, while NetFlix is arresponsible/good company because they support NetNeutrality. But of course, we all know that NetFlix is likewise "all about profits", and their support for NetNeutrality is purely because they will profit by it. The fear I have is that allowing carriers to associate differentiated fees for carriage with a specific service like NetFlix will result in a "channelized" Internet. Comcast or TWC or whomever will broker deals with Netflix and bundle Netflix and 100 other "services" I don't want for a fee > than my Internet fee. Perhaps in this scenario, if I don't take the package and get "broadcast TV" capabilities, I get ISDN era bandwidth to Netflix. Given how limited competition is in the local loop, I just see the scenario you play out having a different outcome. I'm not opposed to fair fees for service. I'm disturbed by the notion that filtering might be used to influence/bias what I access, that my carrier gets to broker or arbitrate or economically leverage my Internet interests. "The only case where NetNeutrality correlates with technical knowledge is among those geeks who manage networks – and it’s an inverse correlation (they oppose it). That’s because they want technologists and not politicians deciding how to route packets"
Robert, as a lefty who follows your blog, and truly enjoys the challenges you pose to my default thinking, I appreciate the facts that you bring to such discussions. You're smart, you're committed, you're honest. Your comments here have done a good job of swaying me to your way of thinking on net neutrality. That is only true because I am willing to look past the fact that you are behaving like a jackass thinking you can accurately attribute motives to people who disagree with your positions. Stick with the facts man. Give folks the benefit of the doubt the way thinking folks on the other side of the political spectrum are willing to give you. Can you please help me understand how Netflix is freeloading? I assume Netflix already has to pay an ISP for bandwidth to put its content on the wire. Are you saying that they should also contribute monetarily to make the network faster for end-users? By saying that 90% subsidize the 10% that stream, are you saying for (a simplified) example, that the 90% pay the same amount to the ISP as the 10% so the ISP can accommodate demand of the 10%? I said it once and I'll say it again. Net neutrality is not about having fast lanes. Its about people deciding who gets the slow lane.